Members of the Skills and Productivity working group are reminded that out final meeting is scheduled for Thursday July 18, 2013 t the Old Belize from 9-12. Please review the revised draft report in preparation for this meeting. 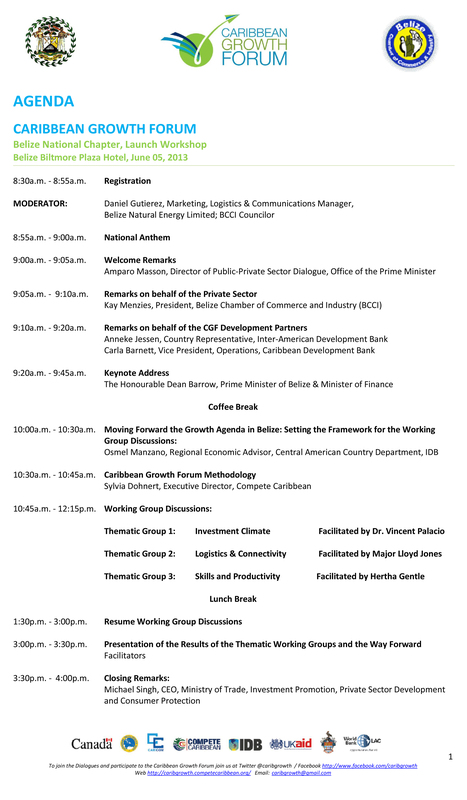 The Third meeting of the Skills and Productivity group is scheduled for Tomorrow June 20th 2013 at 9 – 11 am at Old Belize. Groups members are asked to print the documents which have been forwarded. Please make every effort to attend as your input will be most valuable to the ongoing dialogue. 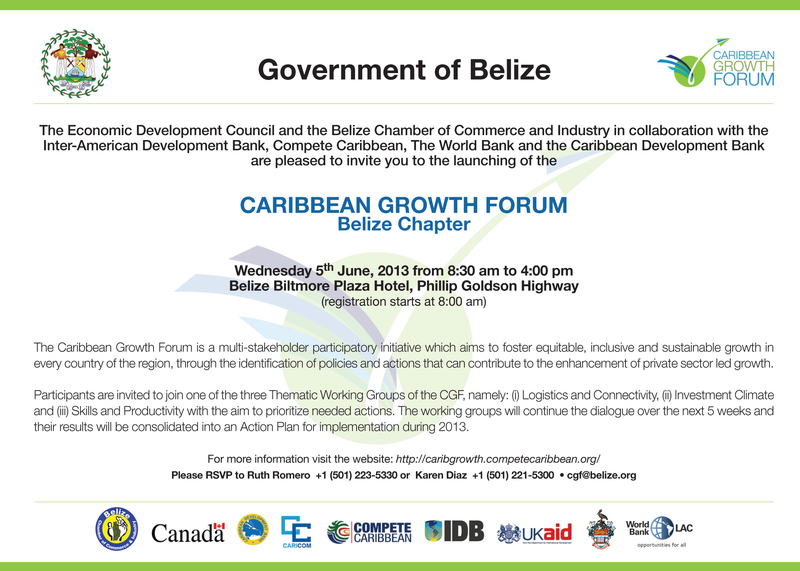 The Economic Development Council and the Belize Chamber of Commerce and Industry in collaboration with the Inter-American Development Bank, Compete Caribbean, The World Bank and the Caribbean Development Bank are pleased to inform you that on June 5, 2013, Belize is going to launch the Caribbean Growth Forum Belize Chapter. 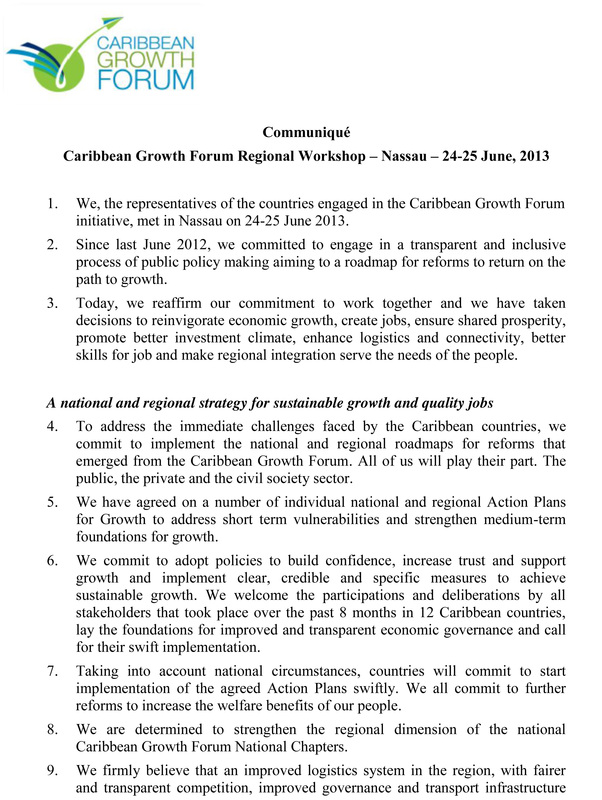 The Forum will commence from 8:30 am to 4:00pm at the Belize Biltmore Plaza Hotel, Phillip Goldson Highway. The Aim of this Chapter is to foster equitable, inclusive and sustainable growth for Belize, through the identification of policies and actions that can contribute to the enhancement of private sector led growth.